Today we welcome Audrey Driscoll to Bad Moon Rising! Lovecraft fans will have a special interest in her book – and what’s even better is there are three more in this series! 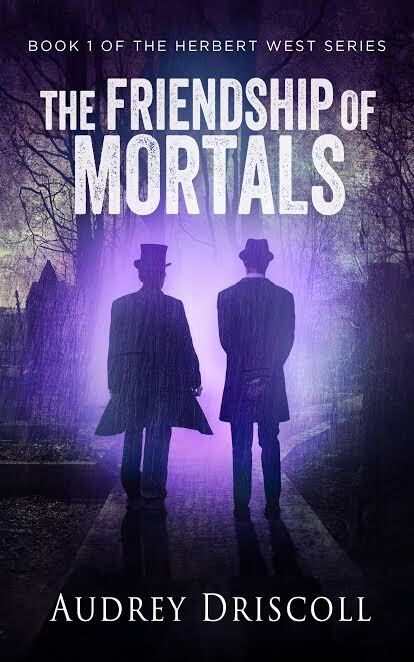 The Friendship of Mortals ebook is currently FREE on Amazon and Smashwords! AD: I recall writing a novel in high school that was set in ancient Egypt and involved a struggle between good and evil. Since just about that time I was reading one of Joan Grant’s “Far Memory” books with a similar setting and theme, I suspect mine was heavily influenced by that. Curiously, my soon-to- be WIP will be set in Egypt. Not in ancient times, but involving archaeological excavations and a search for ancient secrets. So what goes around comes around, even in writing. AD: This is a tough one. Lots of interesting characters I can’t imagine having a drink with. Well, maybe Bilbo Baggins; he definitely appreciates that sort of thing, but since he belongs in a totally different world from mine, it’s unlikely we’ll ever connect. OK, how about Peter Straub’s Tim Underhill? He’s a writer, seems like a thoughtful sort, likes jazz, has had some harrowing life experiences. I can imagine spending a couple of hours in some cozy watering hole in New York City, listening to Tim. Finally – not a fictional character at all, but an author: H.P. Lovecraft. Of course, it wouldn’t be over drinks, because he didn’t do that. Maybe at an ice cream parlour. He liked cats too, so we could talk about them, as well as cosmic horror. AD: Cosmic horror – the realization that the nonhuman world is totally indifferent to us humans and follows its own laws, whether we understand them or not. The concept is captured perfectly in a story by Algernon Blackwood, called “The Willows.” It scared the pants off me when I was twelve, and can still do so nearly 50 years later. AD: Hero – Alexander the Great as portrayed by Mary Renault in Fire From Heaven and The Persian Boy. Villain – Steerpike, from Mervyn Peake’s Gormenghast books. AD: Sticking all the scenes that practically write themselves into a coherent story arc. Going beyond the “great idea” to creating an actual piece of writing that makes sense and engages readers. AD: Right now (September 2016) I am putting the finishing touches on three short fiction pieces that are derivatives of my 4-book Herbert West Series. One is a prequel, another explores a theme that’s implied in the first book but not developed, and the third is a kind of bridge to the novel I will write this winter – the one set in Egypt that will be a sequel to the Herbert West Series. I will publish these stories on Amazon’s KDP at the beginning of October. An exciting aspect for me is that I have designed the cover images for them myself, rather than commissioning a professional like I did for my novels. Audrey Driscoll grew up reading books, and found she was as interested in how stories were constructed as in how they turned out. She worked out scenes and bits of dialogue in her head and made her friends act out little dramas based on her favourite book at the time – Rudyard Kipling’s Jungle Book. With that background, it was inevitable she would become a writer. It just took a while. After establishing a career as a librarian – first at the University of Saskatchewan and then at the Greater Victoria Public Library in British Columbia – Audrey had a meaningful encounter with H.P. Lovecraft’s character Herbert West. Audrey was fascinated by HPL’s corpse-reanimating physician and his friend the nameless narrator. Without her consent, her imagination began to play with them and threw up a scenario in which the friend is not a fellow medical student but a librarian at Miskatonic University. He and Herbert meet over the Necronomicon, HPL’s fabled book of magical lore. The result was The Friendship of Mortals, which was followed by three more novels to form the Herbert West Series. Self-publishing became respectable and relatively easy just in time to rescue Audrey from the sad fate of the Unpublished Writer. After the Herbert West Series, Audrey wrote another novel – Winter Journeys, a celebration of Franz Schubert’s gloriously gloomy song cycle Winterreise. It remains unpublished for now, while its author revisits the world of the Herbert West Series with a sequel and several short stories. 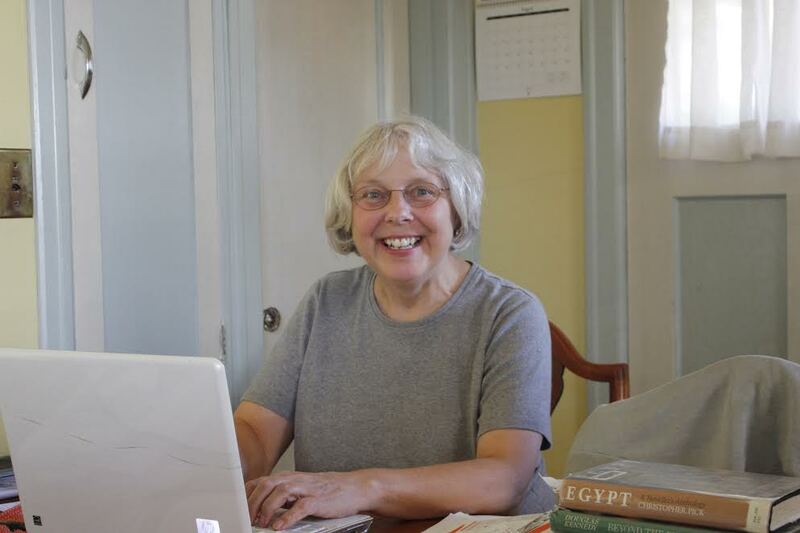 Information about Audrey Driscoll’s writing, and her opinions on a variety of topics, including her other avocation of gardening, may be found by visiting her blog at: www.audreydriscoll.com. Thanks for the opportunity to show off on your blog, Teri! Much appreciated. So glad you could participate, Audrey! I joined a stellar group of authors on Teri Polen’s blog this month, talking about our horror/supernatural themed books. Have a look at the other authors featured; your TBR piles are sure to grow! Congrats, Audrey. I thoroughly enjoyed The Friendship of Mortals.